Seventeen-year-old Jonah Daniels has lived in Verona Cove, California, all his life, and the only thing that changed was his father is no longer alive. Along with his two older siblings he must now take responsibility for his family. Enter new girl Vivi, the next big change in his life. Vivi loves life, she’s gorgeous and funny and she transform’s Jonah’s family and changes his life. But there are always consequences when worlds collide. 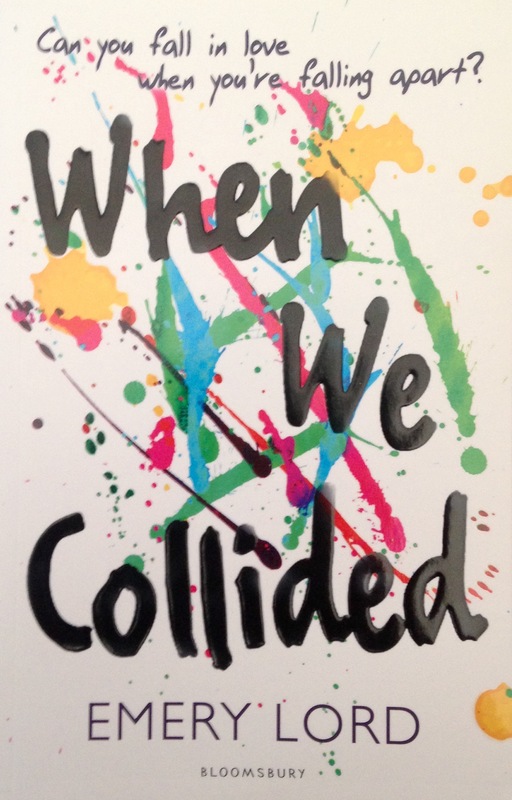 When We Collided is a fast-paced contemporary YA novel with some larger than life characters. Vivi fills up every moment with as much fun as she can give it. She loves with all her heart and immediately feels a connection to Jonah and his family. Jonah is quieter as he has to look after his younger siblings as well as hiding the fact that his mother isn’t really coping with her husband’s death. Jonah’s family feels like a very real and relatable family, they are all dealing with grief in different ways and sometimes they clash over it but that doesn’t mean they love each other any less. The main problem I had with When We Collided was with Vivi. She was almost obnoxiously happy and it was really grating and annoying to read. She would want to do crazy thing with Jonah and his family and didn’t always seem to grasp that he has a lot more responsibilities than her and while he obviously needed time to himself or to have fun sometimes, she seemed to want him to be as happy as she was. As the story progresses you find why Vivi is that way and while I did have some sympathy for her I didn’t find myself empathising with her. So because I wasn’t a fan of Vivi, I didn’t really like her and Jonah’s romance. It felt very rushed and was almost all-consuming for both of them. They clearly both have problems and aren’t 100% themselves so while they do help each other to extent, they are really not right for each other in that moment. Vivi is frequently controlling and jealous and while Jonah has his moments of suggesting how Vivi should act, he instantly gives in to Vivi’s wishes all the time. The setting of When We Collided is pretty great as Verona Cove is a beautiful seaside town so there’s long walks on the beach, a lot of sun and beach parties. The town is almost a secondary character and so is food. Seriously there’s a lot of talk of food in When We Collided, mainly because Jonah wants to be a chef and works at his dad’s restaurant and the way food is described is almost mouth-watering. When We Collided has the perfect summer setting and at its heart has broken characters that may help each other but somethings aren’t so easy to fix. It’s a nice book, a quick read but not that memorable. 3/5. Can you write more why you thought Vivi “was almost obnoxiously happy and it was really grating and annoying to read”? I’m curious why you got that feeling. OK so I read When We Collided about three week ago and to be honest not much has stayed with me (I wrote this review when I read it and just edited it before scheduling it to post) but I’ll give it my best shot. I’m a generally happy and positive person but I’m also a realist. I think I found Vivi obnoxiously happy because she’s sooo positive and happy that she goes beyond what is realistically possible. I get having faith and living for the moment but Vivi was not aware of her restrictions, whether that be her mental health or generally the fact she is a teenager who probably should listen to her mother. Also why I get why she tried to cheer up Jonah, I felt that she didn’t respect his feelings because he was well in his rights to be angry or sad and I personally don’t like it when characters (or people in real life) try to force others to feel a certain way. I think my main problem with Vivi was that why I understand she has a mental illness and that may excuse some of her behaviour (I admit I don’t know a lot about bipolar disorder) I found her not a likeable person so her being overly happy just grated on me even more. I hope that all makes sense and shows why I felt that way about Vivi. I do get a bit paranoid when I don’t like female characters for whatever reason because I know they are often unfairly hated, especially because if a male character did the same things no one would bat an eye. All right, now i got it so mich better. Thank you! I get why you get paranoid with unlinking female characters, I always question myself if I’m really disliking someone or is it just the stereotypes and culture working on my mind and forcing me to dislike someone.